A ton of helpful Jaguar info on Randy Singer's MacAttorney site, How To Deal With Common Macintosh OS X 10.2 Jaguar Problems. The MCE PowerBook G4 Combo Drive upgrade for the 400, 500, 550, and 667 MHz PowerBook G4 is a slot-loading CD-RW/DVD drive designed to replace your built-in DVD-ROM or CD-RW drive with a drive that can do both - burn CDs and play DVDs - eliminating the need to drag around extra hardware and cables. The MCE PowerBook G4 CD-RW/DVD Combo Drive upgrade is compatible with Mac OS X, Mac OS 9, iTunes, Disc Burner, and Apple DVD Player. The drive is bootable and has been certified by Dantz Development for use with Retrospect. 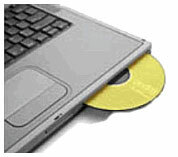 The drive writes CD-R media at 8x speed, writes to CD-RW media at 8x, reads regular CD-ROM media at 24x speed, and reads DVD media at 8x speed. The drive carries a one year warranty. In addition, now MCE is offering Combo Drive/Hard Drive Bundle specials so that if your original hard drive has become too small for your needs or too noisy you can have that replaced while we or one of our Authorized Upgrade Centers has your machine open. MCE is also planning to release a $449 SuperDrive Upgrade for the TiBook around February 25th. An ultra light weight, compact design USB 4-PortMiniHub. Retractable cable, supports most devices without additional AC adapter. Recommended for PowerBook users, iBook users. Dimensions: (W) 5" x (L) 1.1" x (H) 0.4"
The Bluetooth USB Adapter adds Bluetooth technology to your existing USB Mac to let it work with all devices enabled with Bluetooth v1.1 technology. Wirelessly print, synchronize your PDA information, and create dialup connections through a mobile phone. From up to 10 meters away you can effortlessly transfer data to other Bluetooth devices such as desktop or notebook computers, PDAs, scanners, printers, and even mobile phones - wirelessly. Connect with up to seven other Bluetooth devices at a time. The Macally Retractable FireWireCable eliminates the need for you to carry a loose FireWire cable while you are on the road. Compact size and convenient to use. Extra 6 pin to 4 pin adapter included for digital camcorder connection. Soon after the first G3 Wallstreet PowerBooks were released in 1998, users noticed distracting marks on their LCD screens after a short period of use. These marks result from the LCD screen coming into contact with the PowerBook's keyboard when the lid is closed. Oil from your fingertips transfers from the keyboard to the screen, leaving the unsightly marks. To avoid this problem - the PowerPad, a thin piece of leather that slips between your keyboard and screen when your PowerBook is closed. No more marks on the screen. Carlos A. Pero says, "For your enjoyment, I've created a set of six icons of the 17" PowerBook." The Smart Alec is a daypack like you've never seen - clean lines and stealth styling make this bag easy on the eyes. Two exterior pockets are "hidden" in the side panels, and there's an organizer pocket on the inside of the flap at the top of the pack for easy access. Tired of backpacks with endless geegaws, bungee cords and buckles? Consider the Smart Alec. Add either size Monolith computer case and the Smart Alec becomes the perfect answer for those who want a laptop backpack but find the Brain Bag to be too big - perfect for people less than six feet tall. Price: US$95, Canadian, app. $149. 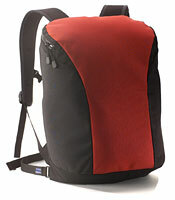 Tom Bihn bags for the 12" PowerBook G4 include the Brain Cell, Monolith, Eclipse, ID, Brain Bag, Empire Builder, Smart Alec, and Trager bags, such as the Hipster and Courier Laptop. The company says, "We are in the process of designing and manufacturing two new cases for the 17" Apple PowerBook G4 - a Monolith type case that will snap inside of our Brain Bag, and an Eclipse that can be carried on its own as a micro-briefcase. "Both of these bags will be the only bags you'll find that have both hard-shell protection and a suspension system to cradle and protect your new laptop. "We expect to have the cases ready to ship in 4-6 weeks - you may even receive the case before you receive the PowerBook! " Stylish, lightweight and rugged, iPod Armor keeps your iPod looking as new as the day you bought it. Unique friction foam interior holds your iPod securely in place, while giving you unobstructed access to the entire front face of your iPod. Nothing stands between you and your scroll wheel. iPod Armor completely encases your iPod, leaving only the ports exposed, so you can plug in your headphones or sync to your Mac/PC. Rugged aluminum construction keeps your iPod safe from scratches and other random daily hazards. Toss it in your bag. Throw it in your purse. No need to worry anymore. Your iPod is safe in its shell. The open-cell EVA foam interior also acts as a cushion, offering extra protection against the accidental (and highly discouraged!) dropping of your iPod. Fits all current iPod models. Want to own the most expensive PowerBook model ever made for under $100? These PowerBook 5300s were hot stuff back in 1995 and still have plenty of power for word processing, email, casual surfing, etc. Get one with built-in ethernet, and you've got a broadband-ready unit. Refurbished with a 30 day guarantee. You can add Wegener's extended 1yr warranty for $45. Add MV16-EN internal ethernet/video card, $20 with purchase!